I am a woman who likes a little simplicity in my household. For example, why should there e four different body washes in the shower. Why can't one body wash work for the whole family? I've found that one body wash - Dial Coconut Water Body Wash. Living through a hard Midwest winter can be difficult on your skin. For the whole family, I look for a nourishing body wash that leaves your skin feeling soft and hydrated. Did you know that Coconut water is found in young, green coconuts and known to be rich in antioxidants and electrolytes that help provide replenishing hydration. I put a bottle of the Dial Coconut Water in the shower over the weekend. It has been cold, damp and miserable in our area. Each morning as I lathered up with the new nourishing body wash, the aroma transported me to a warm, seaside oasis. The coconut scent is refreshing yet not overpowering. With a husband using the same body wash, he doesn't want to smell girlie. This hydrating body wash has you leaving the shower smelling fresh and clean. Of course, you want your skin to not only be clean but to feel good. I found that the Dial skin left my skin feeling healthy and smooth. Dial Coconut Body Wash is available at mass merchant stores and other retailers. Right now Dial has a HUGE promotion, the Healthier You.® Sweepstakes. You could win the Grand prize of $1000. To enter, please visit this website. 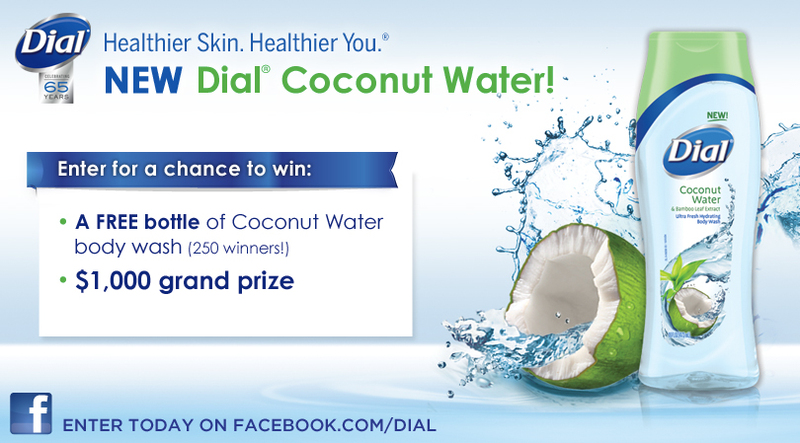 Would you like to try Dial Coconut Body Wash? I have 3 free product coupons to give to one of my readers. Please use the Rafflecopter to enter. 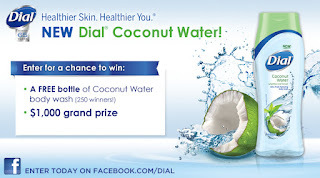 Start your day with fresh hydration and Dial Coconut Body Wash.
Disclosure: Dial Soap provided me with a sample of the NEW Dial Coconut Water Body Wash and product coupons. All opinions are my own. A shower refreshes me in the morning. a fresh diet mt. dew! Bubble bath always refreshes me. Ohh, this stuff smells so good! Thanks for the giveaway! A shower and brushing my teeth. A shower. I'm a zombie until I've had one! a few mumford and sons songs refresh me! A nice hot shower refreshes me. Exercising followed by nice shower. thanks! a hot cup of joe! A hot shower and 2 big cups of coffee! A warm bath and washing my hair. Nothing gets done at my house without a hot shower and a big cup of hot sweet coffee! A cup of hot coffee while sitting outside on my patio. Having a time buffer between waking and starting to get ready for the day is my refresher. A shower and a hot cup of tea! My 5 year old's laughter wakes me up! A shower and a hot cup of coffee. Thank you! I am emailing you a reply now.